Knights of the Dinner Table #227. Since I read KotDT every month, I might as well "review" it here. Since I read it every month, and make at least one special trip to comicbook store 15 miles away to buy it, I'm clearly biased in its favor. The spoof covers are always a highlight and this issue's cover is no exception. 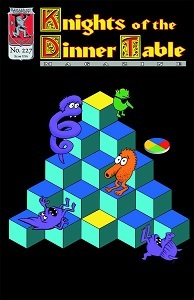 This time it it's a sendup of the old 1980's, quarter-eating game Q*bert. Q*bert was a dumb, annoying, but somehow fun game that was extremely popular for a time. 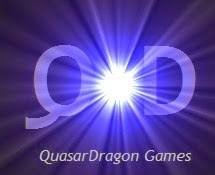 The comics, with the ongoing misadventures of the most dysfunctional adult gamers imaginable. I'd be surprised if anyone reading this hasn't run across the KotDT somewhere, but if you haven't then reading the online strips is a good way to meet the characters. This issue continues the fallout from the ill-advised act of mailing Bob to Hackmaster headquarters and has the Knights and Patty involved involved in a playtest of an adventure for B.A. 's Dawg. Later Brian proposes an investment idea that, given his track record, is likely to fail. No much more can be said without introducing possible spoilers. The stories were amusing, though it should be noted that they are much better the more you read in a row. The second half of Knights of the Dinner Table is a game magazine, with mostly short Hackmaster and generic fantasy articles.There is an interview with Alex Kammer of Gamehole ® Con followed by an interesting generic fantasy "trap" that could easily be adapted to other genres. "Monkey Warfare in RPGs" by Blaine Lee Pardoe is a rather interesting article about non-lethal ways of challenging the PCs. Although it's framed as way to mess with players, there are some perfectly legitimate ways of making adventures more challenging and inducing paranoia, which makes playing more exciting. Regular colums like "Bait & Taackle" (Generic Adventure Hooks), "All Things Magic," and "Denizens of Tellene" (Hackmaster NPCs) were all worth reading and potentially useful. There is a four page Q&A with the fiction Gary Jackson clarifying Hackmaster Rules and a Hackmaster monster. Most of the rest of the issue is filled with reviews. I was especially interested in the Gammarauders review in "Lost Game Safari" having just recently gotten a copy for a buck from a local thrift shop. Overall it was a good issue of a very good 'zine. Talislanta coming to Print on Demand? !